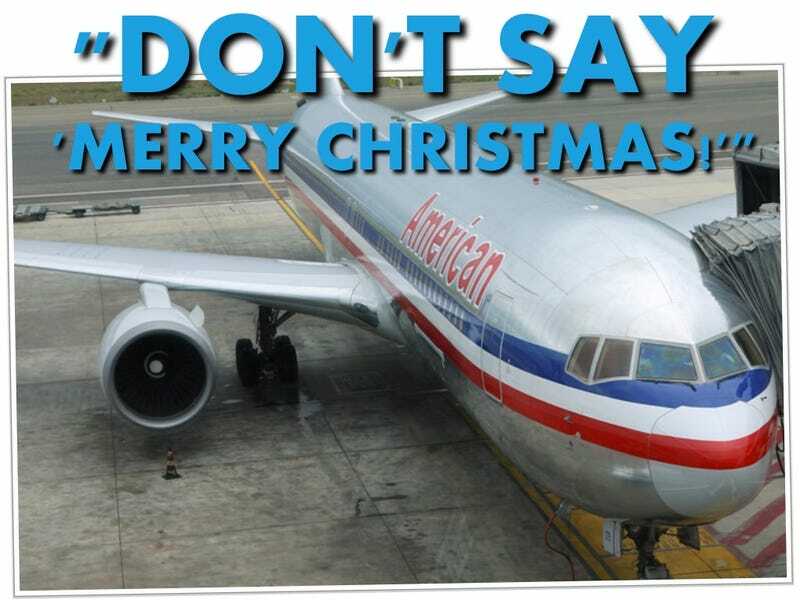 Offended Passenger Kicked Off Plane For Tantrum Over "Merry Christmas"
New York, NY — On Tuesday, a man boarding American Airlines Flight 1140 from La Guardia to Dallas was booted from the plane after throwing a hissy fit. What was the problem? The airline's staff wished him "Merry Christmas", but apparently not everyone celebrates Christmas. Well, boo hoo. That poor little baby. Most people in this nation celebrate Christmas. If, for example, I went to Israel and someone wished me a happy Hanukkah, I'd say thank you. Not flip my lid because the majority won't bend over backwards to cater to my wants. The man was kicked off the plane to a fanfare of cheers and applause.